Unplanned downtime and the impact on production are common aggravation factors in manufacturing jobs. New manufacturing software on your shop floor in 2018 could help with this stress. Machines go down, other machines can’t pick up that slack, and production is halted. An avalanche of consequences follows. Updating manual spreadsheets to track jobs adds to the pain. According to an August 2017 piece from MetalForming Magazine, District President for Robert Half’s Accountemps program Bill Driscoll states 52% of workers are stressed on a daily basis. Three causes of this stress are heavy workloads, hovering deadlines, and perceived unrealistic expectations from management. Address these problems with smart manufacturing. Automation solutions increase equipment productivity and overall morale of workers. The investment is usually smaller than assumed, so extra funds can go towards expanding the workforce and improving work culture. The extra funds can also spent to brainstorm on new products to make or markets to reach. Streamline the process of sending part programs to your machines. Receive text and email notifications when there are machine issues. View your work order schedule in an easier manner. These types of smart manufacturing changes are possible and affordable. See what machines are doing in real-time and collect the data so you can make better production decisions. Software, hardware and protocols like MTConnect can be implemented to further help this process. Many manufacturers have been able to track measurable productivity increases just by monitoring machine utilization. Using clipboards to manually track this data, or worrying if information manually being reported is inaccurate, are worries of the past. You can use this software to manage CNC programs, backup parameters of the machine, and use CNC communication options such as drip-feeding, downloading large programs that are too big for the CNC memory, and bi-directional communication. CNC revision control can be improved, while operations can also be simplified and organized via one network. Don’t waste time going back and forth from the machine to the PC. Don’t grapple with holding a laptop while standing at the machine. DNC is not just limited to software, either – there are wireless devices and Ethernet enhancements available to help with CNC communication. While spreadsheets are a long-standing facet of shop floor culture, it’s time to let go. With the time it takes to manually update them, as well as human error that requires time to correct, there is no ROI when using spreadsheets. Plus, it takes a long time to sift through information to find what you need. When there is a production issue, you also have to manually go into the sheets and change information. 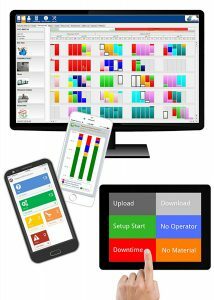 There is software out there that will let you see your production schedule up to 365 days into the future, as well as help you see if you can move jobs to other machines in case of production issues, or if a last minute client needs a rush job. Live updates will show you the positive, and possibly negative, effects when jobs are moved.